New week, new short clips, new first impressions. 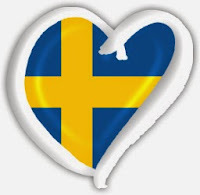 Last week, my first impressions weren't exactly spot on when it came down to predicting any sort of result but that had more to do with me not believing in Sweden's ability to embrace a slick quality song. My bad. This week I ask myself whether there is any point at all in listening to these short clips. Even after a second listening I couldn't hear anything that sounded really interesting. There was nothing that stood out in the way that I would long to hear the full three minutes of these songs. Surprisingly similar in beat to Samir & Viktor's effort last week. I have never been a huge fan of David's entries in the past - I find him a bit too polite to make an impression - but this sounds like a decent chorus at least. Viktor is sweet and so is the song in its own little way. This will be three pleasant minutes that not many people will remember by the end of the presentation. Interesting how Molly can display so much personality outside of stage without bringing any of it with her into the song. It sounds slick and radio friendly but also fairly anonymous. All I get out of this clip is the feeling that a short snippet is nowhere near enough to do this justice. It needs its build-up, progression and the climax I am really expecting, having read everyone else's reviews. Clearly the best energy out of all these clips which is hardly surprising given Krista's track record. Promising but doesn't this sound more like a verse than the chorus it is meant to be? Three good voices but a pretty lean-sounding clip on the total. Like a Balkan ballad with no flute. And with no bite. Good voice but this chorus sounds like an updated remake of any of the disco hits at any given moment of the late 1970's. Maybe it will unfold tonight but so far I had expected more. Last week I felt far from blown away after hearing the short snippets and I feel the same way now. My problem last week was that only two of the songs really developed into personal favourites of mine (Ace & Robin). Now I hope that Isa and Krista will knock me out in the end. Other thoughts: Will Wiktoria's high tech light show make her performance too static? Are the fans of Patrik, Tommy & Uno passionate enough to vote a lot? Will the charm of David Lindgren do the trick again? And will the average viewer even remember that Molly PH failed last year and would deserve some consolation this year? After 14:00 CET the longer clips will be available at the official melodifestivalen website.